A few years back I bought a hugely entertaining collection of stories ‘Inspired by the Holmes Canon’ called A Study in Sherlock. 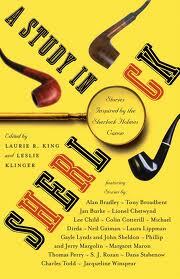 It contained tales by Lee Child, Charles Todd and Neil Gaiman and was edited by Laurie R King and Leslie S. Klinger (the man behind the indispensable New Annotated Sherlock Holmes). What I didn’t know at the time was that the Conan Doyle Estate had threatened to block the book unless a fee was paid, which it duly was. Now, in the USA some of the stories in the final collection, The Case-Book of Sherlock Holmes, are still in copyright, thanks to an extension to copyright law there some years back (in the UK the entire canon is in the public domain), but Leslie Klinger – who is also a lawyer – was certain this did not mean the characters were protected. The ACD Estate begged to differ. If nothing else, legal clarification to those of us paying royalties to one or other of the various claimants to Holmes & Watson would be most welcome and Klinger deserves our support. You can read more on http://www.free-sherlock.com. This entry was posted in Books and tagged Copyright, Sherlock Holmes, Watson on February 18, 2013 by Robert Ryan.